Cardiff New Brass Festival is Tom's new music 'hobby project'. Since it's inception in 2010 it has hosted four new music concerts in the City of Cardiff featuring artists including David Thornton (Euphonium Soloist), Dean Wright (Principat Trumpet Welsh National Opera), Oslofjord Brass (Norway), The Central Band of the Royal Air Force, Wormshead Brass & BTM Band. 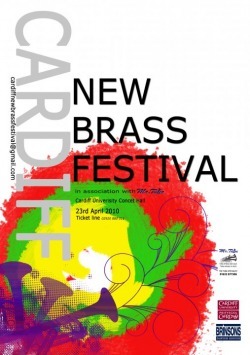 There will be no Cardiff New Brass Festival held in 2013 as Tom will be working with Cardiff based Arcomis Arts Commissioning on their landmark Brass Event. The Brass Event, October 10 - 13 2013 at St. David's Hall Cardiff, is a fantastic opportunity to experience the world's most celebrated brass music and musicians in one place, at one time. The event will package an unrepeatable programme of soloists, ensembles and masterclasses into an exceptional four day festival of brass without boundries. Artists confirmed to appear at The Brass Event include Mnozil Brass, Tine Thing Helseth, Håkan Hardenberger, Allen Vizzutti, London Sinfonietta, Superbrass and the BBC National Orchestra of Wales. Cardiff New Brass Festival 2012 has commissioned three brand new works, which it will be gifting to the British Trombone Society and Royal Welsh College of Music and Drama (RWCMD). The work's by Andy Keenan, Paul McGhee and Artisic Director Tom Davoren will be premiered as part of the British Trombone Society National Festival at the RWCMD on Saturday 26th May. For further information visit the British Trombone Society homepage. If you were to ask me how I like to spend my average Friday evening, going to a brass band festival would be last on my list, along similar lines as going to the football, baby-sitting, or watching Jonathan Ross. Instead, for one night only I was attending the inaugural Cardiff New Brass Festival, which is the brainchild of the young Welsh composer/conductor Tom Davoren and savvy female entrepreneur and conductress Alice Jones. Entering the University Concert Hall with speculation, the first thing that struck me was that there was really any need for this festival at all, considering Wales’s appreciation of its musical heritage; it surprised me to think that this was the first festival of its kind in Wales that specifically celebrates up and coming Welsh brass band and ensemble music. Putting my reservations to one side, my attention was soon diverted by Simon Dobson’s Fanfare, performed by the Wormshead Brass Ensemble, and their conductor-come-presenter for the evening, Nigel Seaman. Immaculately dressed with notes in hand, Nigel could have put any BBC newsreader to shame. His presenting style was confident and fluid, and for your average brass banding novice like myself, his presence and expertise was greatly appreciated. This was followed by Adrian Clifford’s beautiful plain-song inspired O Pastor Animarum, which served as a fantastic contrast. However, the real focus of the first half was the world premiere of Peter Meechan’s Storm, with all eyes on soloist Jonathan Pippen (trom.). This piece really demonstrated the sheer versatility of Wormshead Brass, as they supported their soloist with great ease. Initially, Storm seemed an odd choice of title, although the sheer intensity and dynamism of the second half of the piece clearly illustrated the atmosphere that Meechan was trying to achieve. Confessing his Achilles heel to Nigel shortly before the piece (playing semiquavers at the speed of crotchet = 110), Pippen overcame this displaying his admirable tone and agility to tremendous applause. Subsequently, Cardiff University Brass Band had a hard act to follow. The Saint-Saëns Variations isn’t one of Phillip Sparke’s greatest works, but the band gave it their best shot. Due to the sheer size of the ensemble, (which was twice that of an average brass band) there was inevitably going to be some pitfalls in their performance: most prominently tuning. However, with true professionalism, conductress Alice Jones kept the ensemble tight and together, directing the band clearly and concisely. For an amateur band, their performance was admirable. An hour into the evening, and with two pieces left to perform in the first half, I could no longer feel my backside. After Bill Connor’s programmatic Worm Heads South… A Secret to Unfold and Mervyn Burtch’s intense Wormshead Suite, the interval was somewhat of a relief. After a 90-minute first half, it was clear that the rest of the audience felt the same way too. However, the second half of the festival was much better structured and proved to be quite a contrast to the first. BTM were dressed to the nines and gave a more symphonic performance than any ensemble of the first half, blowing the audience away with their rendition of Gareth Glyn’s powerful piece Dolbadarn. The sound they produced was strong and full-bodied, and the dynamic contrasts they created gave the effect of solid blocks of sound, which sent shivers down my spine on more than one occasion. Following this, they performed the world premiere of Lucy Pankhurst’s Scheihallion, which is based around the folk myths of this Highland mountain. This piece was much easier on the ears than any of the works in the first half, and Pankhurst’s experience of brass band writing is evident. The work itself is atmospheric and makes beautiful and equal use of both harmony and dissonance, with a subtle reference to the Scottish rhythmic cliché of 6/8 in the faster second half of the piece. Mervyn Burtch’s Sonatina for solo Tuba and Piano showcased the up and coming talent of Welsh tuba player Oliver Browne. The piece itself is very different from Burtch’s Wormshead Suite, although his distinctive playfulness with melodic fragments is still audible. Browne, accompanied by Chris Williams, was superb. The first movement required a highly sustained and supported tone, whilst the second tested range and agility. The final movement was incredibly restless and jumpy, but Browne made it look effortless. This young tuba player is definitely one to watch. As a self-confessed loather of football, I was immediately sceptical of Peter Meechan’s second world premiere of the night, Epitaph (for Hillsborough): a work of remembrance for those who lost their lives at the Hillsborough football disaster of 1989. However, this piece was captivating and emotional from the very beginning. With sobering references to the Last Post and the Liverpool theme You’ll Never Walk Alone, the piece slowly works towards an intense and relentless climax, ending with staggered clapping that now universally replaces the 1-minute silence at football matches. The final piece of the evening paid homage to the respected British composer Edward Gregson, with BTM’s rendition of his Rococo Variations. It was a fitting finale to the festival, displaying the incredible accuracy and potential maximum volume that this band can achieve. A special mention must also be made to the soprano cornet player, whose incredible final note really did finish the evening on a high. Generally, this was a thoroughly enjoyable evening’s entertainment that did everything it said on the tin: celebrating new Welsh music for brass. Although primarily pitched at the hard-core brass banding community, as a newcomer I was made to feel very welcome. Better programming of the first half could have made the evening more enjoyable, and in aspiring to the long established RNCM Festival of Brass I feel that the event was always going to struggle in its first year. However, it definitely has the potential to reach this goal and perhaps with the proposed allegiance with an unnamed Norwegian brass band in 2011, the organizers of this event may be resigned to add the word International to its title.